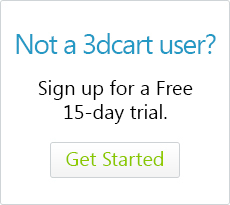 3dcart offers several plugins to enhance your online store services. Your 3dcart monthly package may include some of the plugins already. If not, you can always purchase a plugin for an additional monthly payment, or a one time fee. If your 3dcart plan includes any of the plugins, please feel free to email us at [email protected] to have us install them for you. You can also call us at 800-828-6650 ext. 3 to have any of plugins added to your plan. Website Statistics allow you to compile analytical reports about your website. You can see who is visiting your site, which pages are visited the most, and the amount of time customers are spending browsing your pages. Website Statistics is included in the 3dcart Standard plan or higher. If you have a lower plan you can purchase it for $15.00/month or a one time fee of $129.00. The Quickbooks plugin allows you to export your order and customer information from the 3dcart admin panel to your Quickbooks application. This will allow you to manage all sales and customer information with Quickbooks. This plugin integrates with Quickbooks version 2003 and higher. The Quickbooks plugin is included with the 3dcart Standard Plus plan and higher. If you have a lower plan, you may purchase it for $15.00/month or a one time fee of $195.00.